Add some color to your office life with the ultimate in the color coding experience. Full color offering of polypropylene top loading sheet protectors. Use alone or with both the Sheet Protectors with Index Tabs and Sheet Protectors with Colored Edges. Color coding works to organize and set apart presentations. No sheet punching necessary. Assorted colors including 10 each of blue, green, pink, yellow and non-glare. 50/BX. 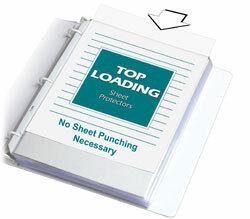 Sheet Protector Special Features: Stay organized with colored sheet protectors. It ensures that documents can be stored in a standard 3-ring binder, while being easily identified through the use of color.